The humble butterfly could hold the key to unlocking new techniques to make solar energy cheaper and more efficient, according to the results of pioneering new research. A team of experts from the University of Exeter in the UK has examined new techniques for generating photovoltaic (PV) energy - or ways in which to convert light into power. The scientists showed that by mimicking the V-shaped posture adopted by Cabbage White butterflies when heating up their flight muscles before take-off, the amount of power produced by solar panels can be increased by almost 50 per cent. Crucially, by replicating this “wing-like” structure, the power-to-weight ratio of the overall solar energy structure is increased 17-fold, making it vastly more efficient. The research by the team from both the Environment and Sustainability Institute (ESI) and the Centre for Ecology and Conservation, based at the University of Exeter's Penryn Campus in Cornwall, UK, was published online on July 31, 2015 in an open-access article in Scientific Reports. The article is titled “White Butterflies As Solar Photovoltaic Concentrators.” Professor Tapas Mallick, lead author of the research said: "Biomimicry in engineering is not new. However, this truly multidisciplinary research shows pathways to develop low cost solar power that have not been done before." The Cabbage White butterflies are known to take flight before other butterflies on cloudy days - which limit how quickly the insects can use the energy from the sun to heat their flight muscles. This ability is thought to be due to the V-shaped posturing, known as reflectance basking, that these butteflies adopt on such days to maximize the concentration of solar energy onto their thorax, which allows for flight. When it comes to vaccinating their babies, bees don't have a choice -- they naturally immunize their offspring against specific diseases found in their environments. And now for the first time, scientists have discovered how they do it. Researchers from Arizona State University (ASU), the University of Helsinki, the University of Jyväskylä, and the Norwegian University of Life Sciences made the discovery after studying a bee blood protein called vitellogenin. The scientists found that this protein plays a critical, but previously unknown, role in providing baby bees with protection against disease. The findings was published online on July 31, 2015 in the open-access journal PLOS Pathogens. The article is titled “Transfer of Immunity from Mother to Offspring Is Mediated via Egg-Yolk Protein Vitellogenin.” "The process by which bees transfer immunity to their babies was a big mystery until now. What we found is that it's as simple as eating," said Dr. Gro Amdam, a Professor with ASU's School of Life Sciences and co-author of the paper. "Our amazing discovery was made possible because of 15 years of basic research on vitellogenin. This exemplifies how long-term investments in basic research pay off." Co-author Dr. Dalial Freitak, a postdoctoral researcher with University of Helsinki adds: "I have been working on bee immune priming since the start of my doctoral studies. Now almost 10 years later, I feel like I've solved an important part of the puzzle. It's a wonderful and very rewarding feeling!" In a honey bee colony, the queen rarely leaves the nest, so worker bees must bring food to her. Forager bees can pick up pathogens in the environment while gathering pollen and nectar. The American Society of Human Genetics (ASHG) has named Charles R. Scriver, M.D., Alva Professor Emeritus of Human Genetics, and Professor of Pediatrics, Biochemistry (Associate), Biology (Honorary), and Human Genetics at McGill University; as the 2015 recipient of the annual Victor A. McKusick Leadership Award (http://www.ashg.org/pages/awards_overview.shtml#mckuskick). This award, named in honor of the late and legendary Victor A. McKusick, M.D., widely and quite legitimately regarded as the “father of medical genetics” for his seminal work establishing the field, recognizes individuals whose professional achievements have fostered and enriched the development of human genetics as well as its assimilation into the broader context of science, medicine, and health. The ASHG will present the McKusick Award, which will include a plaque and monetary prize, to Dr. Scriver on Friday, October 9, during the ASHG’s 65th Annual Meeting (http://www.ashg.org/2015meeting/) in Baltimore. There is not an award in all of genetics that is more prestigious than one that bears the name, and honors the memory, of the great Victor McKusick. Dr. Scriver has worked at McGill University in Montreal for more than 50 years, having founded the deBelle Laboratory for Biochemical Genetics in 1961. He has dedicated his career as a clinician-scientist to discovering, training, treating, and educating the public about inherited metabolic and other genetic diseases. After a year of clinical work at Children’s Medical Center, Harvard, followed by two years in the laboratory at University College Hospital Medical School, London, Dr. Scriver unexpectedly encountered a recurrent seasonal epidemic in Quebec, which affected thousands of infants and children with Vitamin D deficiency. A deadly fungus identified in 2013 could devastate native salamander populations in North America unless U.S. officials make an immediate effort to halt salamander importation, according to an urgent new report published in the July 31, 2015 issue of Science. The article is titled “Averting a North American Biodiversity Crisis.” San Francisco State University (SFSU) biologist Dr. Vance Vredenburg, his graduate student Tiffany Yap, and their colleagues at the University of California, Berkeley and the University of California, Los Angeles say the southeastern United States (particularly the southern extent of the Appalachian Mountain range and its southern neighboring region), the Pacific Northwest and the Sierra Nevada, and the central highlands of Mexico are at the highest risk for salamander declines and extinctions if the fatal Batrachochytrium salamandrivorans (Bsal) fungus makes its way into those regions. Salamanders are popular worldwide as pets, and frequently traded across borders. That has scientists worried that the fungus could spread from Asia, where it likely originated, to other parts of the globe. Dr. Vredenburg and his coauthors on the study are asking the U.S. Fish and Wildlife Service to place an immediate ban on live salamander imports to the U.S. until there is a plan in place to detect and prevent the spread of the Bsal fungus. Although the ban has been supported by key scientists for some time, including in a prominent op-ed in the New York Times last year, the government has been slow to act. "This is an imminent threat, and a place where policy could have a very positive effect," Dr. Vredenburg said. "We actually have a decent chance of preventing a major catastrophe." Researchers have recreated the evolutionary lineage of adeno-associated viruses (AAVs) for the purpose of reconstructing an ancient viral particle that is highly effective at delivering gene therapies targeting the liver, muscle, and retina. This approach, published on July 30, 2015 in an open-access article in Cell Reports, could be used to design a new class of genetic drugs that are safer and more potent than those currently available. The article is titled “In Silico Reconstruction of the Viral Evolutionary Lineage Yields a Potent Gene Therapy Vector.” "Our novel methodology allows us to understand better the intricate structure of viruses and how different properties arose throughout evolution," says senior study author Dr. Luk H. Vandenberghe of Harvard Medical School. "We believe our findings will teach us how complex biological structures, such as AAVs, are built. From this knowledge, we hope to design next-generation viruses for use as vectors in gene therapy." Viruses need to efficiently transfer their genetic material into host cells in order to replicate and survive. Researchers have taken advantage of this natural property to develop viral vectors, or carriers, capable of shuttling therapeutic genes to the appropriate cells or tissues. Early-stage clinical trials have demonstrated the safety and effectiveness of this approach for treating inherited blindness and hemophilia. But so far, AAVs used for gene therapy have been chosen from naturally circulating viral strains, which patients may already have been exposed to, which means they would have natural immunity. Because natural immunization blocks the transfer of the therapeutic gene, these individuals are often ineligible for gene therapy. Patients with type 1 diabetes have significantly lower blood levels of four proteins that help protect their tissue from attack by their immune system, scientists report. Conversely, the patients’ first-degree relatives, who share some of the high-risk genes but do not have the disease, have high levels of these proteins circulating in their blood, said Dr. Jin-Xiong She, Director of the Center for Biotechnology and Genomic Medicine at the Medical College of Georgia (MCG) at Georgia Regents University. Healthy individuals without the risky genes also have higher levels of the four proteins, IL8, IL-1Ra, MCP-1, and MIP-1β, according to the study published online on July 9, 2015 in the Journal of Clinical Endocrinology & Metabolism. The article is titled “Large-Scale Discovery and Validation Studies Demonstrate Significant Reductions in Circulating Levels of IL8, IL-1Ra, MCP-1, and MIP-1 in Type-1 Diabetes Patients.” The findings point toward a sort of protein cocktail that could help at-risk children avoid disease development, as well as new biomarkers in the blood that could aid disease diagnosis, prognosis, and management, said Dr. She, Georgia Research Alliance Eminent Scholar in Genomic Medicine and the study's corresponding author. The scientists looked at a total of 13 cytokines and chemokines, which are cell signaling molecules involved in regulating the immune response. They first looked at blood samples from 697 children with type 1 diabetes and from 681 individuals without antibodies to insulin-producing pancreatic beta cells, a hallmark of this generarally autoimmune disease. The scientists then analyzed the blood of a second and larger set of individuals, which included 1,553 children with type 1 diabetes and 1,493 individuals without any sign of anti-beta-cell antibodies. In a project spearheaded by investigators at the University of California (UC) San Francisco (UCSF), scientists and collaborators have devised a new strategy to precisely modify human T cells using the genome-editing system known as CRISPR/Cas9. Because these immune-system cells play important roles in a wide range of diseases, from diabetes to AIDS to cancer, the achievement provides a versatile new tool for research on T cell function, as well as a path toward CRISPR/Cas9-based therapies for many serious health problems. Using their novel approach, the scientists were able to disable a protein on the T-cell surface called CXCR4, which can be exploited by HIV when the virus infects T cells and causes AIDS. The group also successfully shut down PD-1, a protein that has attracted intense interest in the burgeoning field of cancer immunotherapy, as scientists have shown that using drugs to block PD-1 coaxes T cells to attack tumors. The CRISPR/Cas9 system has captured the imagination of both scientists and the general public, because it makes it possible to easily and inexpensively edit genetic information in virtually any organism. T cells, which circulate in the blood, are an obvious candidate for medical applications of the technology, as these cells not only stand at the center of many disease processes, but could be easily gathered from patients, edited with CRISPR/Cas9, then returned to the body to exert therapeutic effects. But in practice, editing T cell genomes with CRISPR/Cas9 has proved surprisingly difficult, said Alexander Marson, Ph.D., a UCSF Sandler Fellow, and senior and co-corresponding author of the new study. "Genome editing in human T cells has been a notable challenge for the field," Dr. Marson said. The role of over 300 mammalian genes (mouse) has been revealed by scientists across Europe in a major initiative to understand the part they play in disease and biology. The results have were published online on July 27, 2015 in Nature Genetics. The article is titled “Deciphering Mammalian Gene Function through Broad-Based Phenotypic Screens across a Consortium of Mouse Clinics.” Because mice share 90 percent of our genes, they play an important role in understanding human genetics. The European Mouse Disease Clinic (EUMODIC) brought together scientists from across Europe to investigate the functions of 320 genes in mice. Over half of these genes had no previously known role, and the remaining genes were poorly understood. In order to study gene function, the EUMODIC consortium produced mouse lines which each had a single gene removed. These mouse lines were then analyzed in mouse clinics, where each line was assessed by a series of tests and investigations, allowing researchers to establish the role of the missing genes. Over 80 percent of the mouse lines assessed had a characteristic that provided a clue to what the missing gene’s role might be. If the mouse fails a hearing test, for example, it suggests the missing gene has a role in hearing. In total, the researchers carried out over 150 different tests on each mouse line. EUMODIC represents the first step towards the creation of a database of all mouse gene functions, a vision now being realized by the International Mouse Phenotyping Consortium (IMPC). The IMPC incorporates 20 centers from across the globe with the aim, over the next ten years, of uncovering the role of all 20,000 genes in the mouse genome. The rapid spread of a common and deadly brain tumor has been slowed down significantly in a mouse model by cutting off the way some cancer cells communicate, according to a team of researchers that includes University of Florida (UF) Health faculty. The technique improved survival time by 50 percent when tested in a mouse model, said Loic P. Deleyrolle, Ph.D., a Research Assistant Professor of Neurosurgery in the UF College of Medicine. Researchers focused on disrupting the cell-to-cell communication that allows cancer stem cells to spread. To do that, they targeted a channel that cancer cells use to transfer molecules. By cutting off their communications pathway, it is possible to keep the deadly cells in check, Dr. Deleyrolle said. Eight UF Health researchers took part in the study, which was co-authored by Dr. Deleyrolle and published in an open-access article in the May 19, 2015 issue of Cell Reports. The article is titled “Differential Connexin Function Enhances Self-Renewal in Glioblastoma.” The UF scientists collaborated with researchers at the Cleveland Clinic and the University of California, Berkeley in this research effort. Glioblastoma is the most common brain tumor in adults and there is no effective long-term treatment. Patients usually live for just 12 to 15 months after diagnosis, according to the National Cancer Institute. Glioblastoma tumors, which are highly malignant, typically start in the largest part of the brain and can spread rapidly. The current research focused on connexin 46, a protein that is an essential component of cancer stem cells. Connexin 46 is part of intercellular channels known as a gap junctions. Those intercellular channels, which allow cells to exchange molecules and ions, are crucial to the growth of a glioblastoma tumor, researchers found. While the stature of pygmies is well-suited to tropical rainforests, the mechanisms underlying their growth remain poorly understood. In order to decipher these mechanisms, a team of scientists from the CNRS (Laboratoire Dynamique de l'Evolution Humaine), IRD (Laboratoire Patrimoines Locaux et Gouvernance) and UPMC1 (Centre de Recherche Saint-Antoine) studied a group of Baka pygmies in Cameroon. Their findings revealed that the Baka pygmy growth rate differed completely from that of another pygmy cluster, despite a similar adult height, which implies that small stature appeared independently in the two clusters. This work was published online on July 28, 2015 in an open-accerss article in Nature Communications. The article is titled “Growth Pattern from Birth to Adulthood in African Pygmies of Known Age.” The stature of pygmies has intrigued Westerners since their first encounter with them in 1865. This population is, in fact, made up of several ethnic groups, which belong to two main clusters. One is spread across Equatorial West Africa (Congo, Cameroon, Gabon, Central African Republic, and Western DRC) while the other is found in East Africa, in Eastern DRC and Rwanda. They all live in forested regions, linked with Bantu farmers. 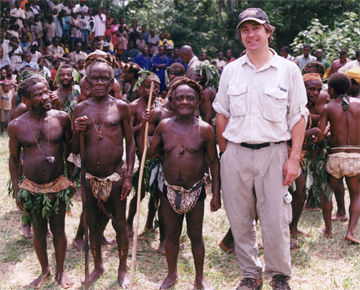 Although genetic factors are responsible for the small stature of pygmies, until now, scientists were unable to produce reliable data on their age in order to analyze their growth patterns. Thanks to the registers of the Catholic mission in Moange-le-Bosquet, Cameroon, it was possible, in the current research, to study 500 members of the Baka ethnic group for eight years in order to establish the first growth curves for pygmies. The scientists were thus able to show that although the body size at birth of the Baka was within normal limits, their growth rate then slowed significantly until the age of three years.